Sign up for Broadjam today to follow Kore Ionz, and be notified when they upload new stuff or update their news! Half-Hour Revolution represents a current direction in music, where the artist is in control and their music and message remains uncluttered by the influence of "big business" labels. The sound is real and natural, devoid of electronic enhancement. 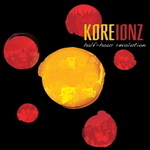 With the rhythm and harmony of reggae and the intensity of rock, Kore Ionz have sculpted a record that is entirely their own, both creatively and on paper. They dedicate this album to all those suffering from injustice and to all those laboring to absolve it. 50% of the proceeds from this album will be donated to The Service Board to help fund mentorship, leadership, and community service programs for marginalized youth in South Seattle. money's just paper that's passed around. you gave some to me. but I cannot buy anything 'cause all the stores have burned down. what good is this bank account that I opened yesterday, when I've got nothing? nothing to save! 'cause all the systems in this world will surely burn down. what good is your fast machine that's destined to blow? 'cause all we need is some food, a roof, and a simple, happy tune. 'cause everything we do, we do it together. 'cause all the systems in this world will surely burn down. we'll take your broken machine and help it to grow. 'cause all we need is some food, a roof, and a simple, happy tune. 'cause everything we do, we do it together. save me just one. I'm so hungry. what am I doing with my precious time? when will my faith put food in my hands? we are the struggling. we are the loving. we are the waiting. waiting for a piece of that golden and crispy. save me just one. I'm so lonely. what am I doing with my precious time? when will my faith put her in my hands? we are the struggling. we are the loving. we are the waiting. waiting for her embrace. my lover's embrace. the streets were alive after the rain, and the laughter led us to the children. no reason for alarm, but it was late. who's watching over them as they play? tell me why are you all alone on the street while your mother and your father are home asleep? what I can recall like it was yesterday was the kid with one leg and still a smile on his face. as he hobbled around like a bull on parade, we became friends and then we played. tell me why are you all alone on the street while your mother and your father are home asleep? who is watching over us as we play? who's watching over us?